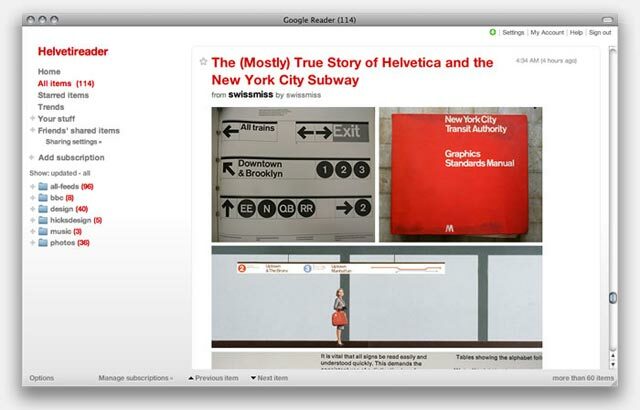 Jon Hicks has just launched Helvetireader a wonderfully minimalist yet superbly usable theme for Google Reader. I’ve used Google Reader as my RSS application of choice despite it’s rather cluttered and ugly interface; I mean what is it with Google and pale blue? Anyway, I’ve tried the Better GReader plug-in and a few other themes but none really worked for me; that is until now. Helvetireader is frankly beautiful. It makes the news articles the focus of its design and removes all of the cruft and extraneous clutter that the Google Engineers have added. I was going for minimal, inspired partly by Times, a newspaper style RSS reader, and the postcards that came with the (Deluxe!) Helvetica Film DVD. And he has succeeded wonderfully; although I now wish I’d bought the Deluxe version of Helvetica. If you use Google Reader you can get Helvetireader here and I strongly recommend you do. I will test it out this weekend!